MEAP (Multiple Exon Array Preprocessing) is an R package that is designed to preprocess, analyze and visualize Affymetrix GeneChip exon array data. 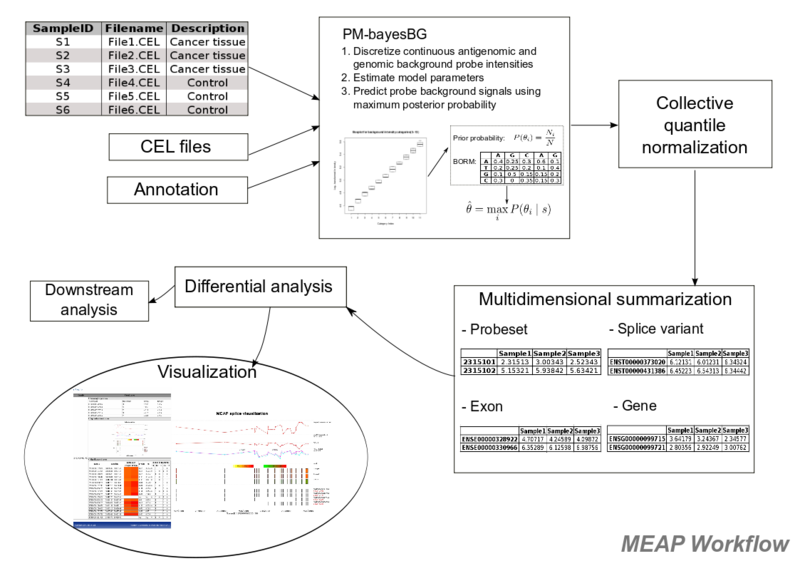 MEAP uses a Bayesian model (PM-BayesBG) to estimate sequence-based backgrounds and is able to produce expression data at multi-dimensional scales. Automatically generated web-report for candidate genes facilitate the visualization of alternative splicing events (Example: NEO1 gene). Chen P, Lepikhova T, Hu YZ, Monni O and Hautaniemi S. Comprehensive Exon Array Data Processing Method for Quantitative Analysis of Alternative Spliced Variants. Nucleic Acids Research. 2011 Oct;39(18):e123. Epub 2011 Jul 10. Web site copyright Systems Biology Laboratory, University of Helsinki. MEAP copyright © 2010-2014 Ping Chen.